This weekend marks a very special celebration in Britain and the British Commonwealth. It is the Diamond Jubilee of HM Queen Elizabeth II who has now reigned as British sovereign for no less than sixty (60) years. It is a remarkable achievement which will be celebrated with many special public events, street parties and home parties over the coming days. My contribution to this celebration is a simple but sincere one. If you are getting together with family and friends to celebrate this weekend, make some homemade ice cream with a 'red white and blue' theme. There's no need for artificial colorings, no need for anything unusually elaborate to do this. 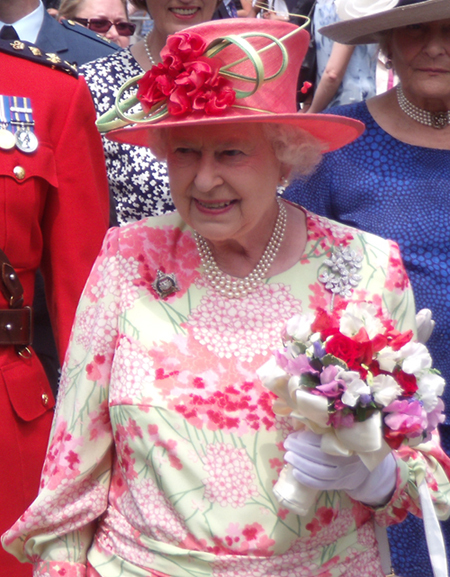 This wonderful photo of The Queen was taken during a trip to Canada in 2010. I love the 'raspberry ripple' color scheme! Here's to a happy, celebratory weekend in honor of a remarkable woman who has touched the lives of countless people during her many years of devoted service to her country. Long may that continue.